A Videographer is the person behind the camera, shooting all types of productions and events such as; corporate videos, B-roll footage for film and TV productions, weddings, business meetings, music videos, and even Bar Mitzvahs. Usually, the Videographer will both shoot and edit the film, taking the project through to completion themselves. Further, Videographers usually work on a freelance basis. High-end production equipment is no longer a necessity for Videographers because viral content doesn’t always need to be highly polished, and even entry-level kit can output professional HD quality footage. The only thing that matters is what you’re shooting and how you frame it. Thankfully due to the ever-increasing digital environment and cheaper editing software becoming a Videographer is now more accessible to the masses. People are consuming more video than ever before, so there is a growing demand for content and an expanding industry for visual storytellers. You needn’t have the most expensive equipment possible. A decent starter kit would comprise a decent DSLR camera, a tripod, a microphone, and a subscription to editing software such as Adobe Premiere Pro. Given the basic equipment required, your success in the industry is down to how you use it, and the skills you have. You need to be passionate about whatever you’re shooting because word-of-mouth will develop your career and open up further opportunities. This means that you need to be a good salesperson and be ready to promote your brand at every opportunity. You need to be great at communicating with people and making them feel at ease. You can hardly expect the best results if you are unable to make the person in front of the camera comfortable. To excel as a Videographer you need to be an enthusiastic learner. In this fast-paced tech landscape, you need to constantly stay up-to-date with the latest developments and be willing to continuously learn new things to improve your offering. Initially, creating a varied portfolio of work is one of the most important things you need to do, having various production examples will benefit you in the long run! You want to translate your work to clients and show that no job is too small or tedious for you and that you bring your A-game to every project. Social media is a great way to start off, by getting your videos out there and building traffic to your website or video channels. You could begin by making short documentaries, or even just shooting your friends having a good time – as long as you’re creating engaging content then you’re good to go. The working hours of a Videographer will vary, depending on the number of projects ongoing at one point in time. 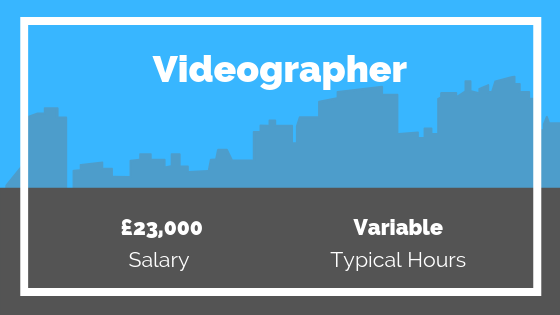 According to PayScale, the average Videographer salary in the UK is £23,000, ranging from £16,000-£33,0000 depending on location and experience. Everyone needs to start somewhere, and Videographers would usually take their first steps in professional production as a Camera Assistant, Runner or Production Assistant. Taking these kinds of entry-level positions will help to build your experience, and will also benefit you in the long run, by allowing you to build up a network of contacts who’ll keep you in mind when you eventually become established enough to book big gigs that require a few helping hands! You could also look to volunteer your time at local community productions. Working at a local TV station will enable you to build basic skills and knowledge which will be essential for this role. Further, you could look to undertake an internship. You could also look to gain a formal qualification to improve your career prospects. For instance, Central Film School offers an undergraduate qualification in Practical Filmmaking. You can find out more about the course here. If you are ready for the next step in your career, why not take a look at the latest Videographer vacancies on our jobs board? You can view our latest vacancies here.